“Can I claim this?” Daniel Radcliffe asks rhetorically when questioned about working with stage veteran John Cullum, stern English teacher Professor Stevens to Radcliffe’s rebellious Columbia University freshman Allen Ginsberg in John Krokidas’ pre-Beat Generation saga Kill Your Darlings. The diminutive actor bounces out of his chair and rushes across the room to confer with with the director, who is in the middle of his own interview. After a short conference, he’s back. That the 24-year-old Radcliffe would be so keen to hear theater lore from half a century ago is hardly surprising given the path he’s chosen since the curtain came down on Harry Potter, the franchise that made him a household name while he was still a child. On stage, he’s been the boy who blinds horses in Equus, go-getter J. Pierrepoint Finch in the musical How to Succeed in Business Without Really Trying, and most recently the titular character in the recent London revival of Martin McDonagh’s The Cripple of Inishmaan. On television, he stars opposite Jon Hamm (playing his older self) as a tyro physician in the pre-revolution Russian countryside in A Young Doctor’s Notebook. In film, his tastes run toward the independent, as evidenced by the three films that he is promoting at the Toronto International Film Festival. In Horns, Alexandre Aja’s adaptation of Joe Hill’s novel, he plays a man suspected of murder who sprouts devil horns. Michael Dowse’s buoyant romantic The F Word, casts him as a lonely Brit in Toronto who falls hard for platonic friend Zoe Kazan. Radcliffe was a teenager and still playing Harry Potter when Krokidas cast him in Kill Your Darlings. 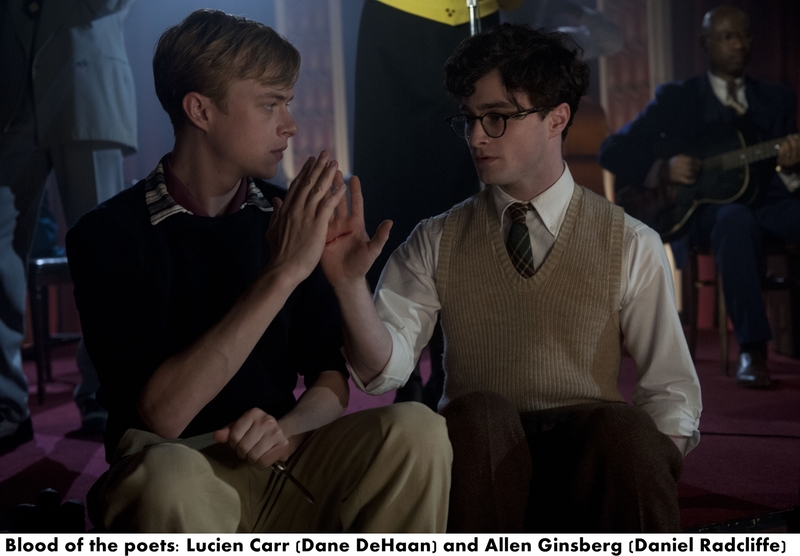 Based on real incidents, the drama is kind of a Beat Generation pre-history as it charts Ginsberg’s friendship with fellow Columbia student Lucien Carr (DeHaan), who profoundly influences the young poet’s approach to writing and introduces him to his eventual partners in literary revolution, William S. Burroughs (Ben Foster) and Jack Kerouac (Jack Huston). Carr also threatens all of the futures when his volatile relationship with an older man, David Kammerer (Michael C. Hall), takes a darker turn. Radcliffe was already familiar with Ginsberg’s poetry, but knew less about the man. He found a key into the character through the diaries Ginsberg kept from a very early age. The writer’s self-assurance impressed him and also gave him insight into the friendship Ginsberg would later forge with Carr. “He’s so confident, as a 14-year-old, in his writing about his own mind,” Radcliffe says. “When he keeps his diary, you sort of almost feel like he’s keeping it for posterity. You feel like he’s writing so that people can read it after he becomes a great man. He’s very much aware of his intellect. “I think that’s what’s interesting about the character of Allen, he’s very confident,” he adds. “He feels like he can hold a conversation with anybody about anything. He’s hugely confident, and yet in his interactions with people and his social life, he’s incredibly shy and reserved and there’s no semblance of that very, very confident person that writes in that diary until they start talking about poetry or about books. Then he feels confident. He can enter into that conversation. Whatever Kill Your Darlings‘ fortunes are at the box office, for Radcliffe it is already a significant film in his career. In a way, his situation mirrors his character’s as he made new friendships during the course of making the movie.